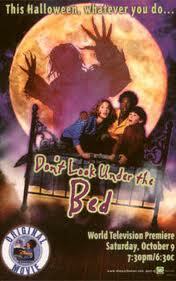 Last year was the first time in YEARS that Disney Channel played Don’t Look Under the Bed! They will be airing it this year on July 2, 2012 at 2:30am (ET). Don’t Look Under the Bed was a 1999 Disney Channel Original Movie, and was the first to be rated TV-PG due to scary scenes. Set your DVR because it is NOT available on DVD and who knows if they will play it again at Halloween.